A Keynsham mum has spoken of her anger after her son’s off-road motorbike was stolen by a man who persuaded the boy to let him ride it. She said the 14-year-old had saved and earned money to buy the bike, which he’d spent most of the summer riding until the theft on August 16. She said: “My son was really shaken up and blamed himself – he worked hard to get that bike. Police are appealing for information following the incident, which happened on land near Broadmead Lane at 4.15pm on the Thursday. The man said he was interested in moto-cross scrambling, persuaded the teenager to let him have a go on the bike and then rode off on it. A man and a woman who were with the suspect drove away in a silver Ford Ka. The man who took the bike is described as white, about 20 years old, with a police tag on his left ankle. He was slim with a muscular build, with short dark hair. He was wearing a black top with gold writing and jeans. The man driving the car is described as white and aged about 20. He is tall and skinny with long blond hair, and was wearing a black hat with a flat peak and a tracksuit. The woman in the car was white, around 18 years old with fair hair in a bun. She is missing some top front teeth. 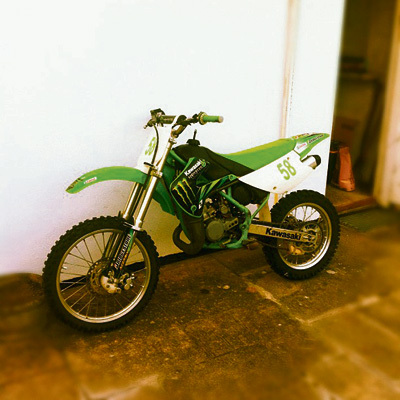 The stolen motorbike is an 85cc Kawasaki big wheel off-road hybrid. Anyone with information is asked to contact police on 101, or the charity Crimestoppers anonymously on 0800 555 111 or via www.crimestoppers-uk.org.